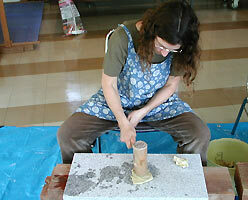 For creating Japanese woodblock prints, the handmade paper, called washi, is indispensable. Its peculiarity lays in the use of bast with long fibres und a special papermaking technique, nagashi-zuki, which is unique in the world. In opposite to Western woodblock printing, where a layer of oil-based ink is printed on top of the paper, during Japanese woodblock printing the water-based ink is pressed deeply into the paper. The very absorbent and strong Japanese paper is able to absorb the ink evenly and to resist the often repeated printing without loosing its shape. 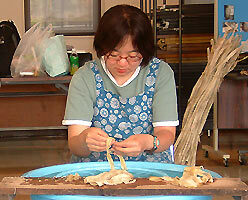 Handmade paper has a long tradition in Japan and was used over the centuries for the most different purposes. Paper was used as letter paper, for calligraphy, woodblock prints, books and as wrapping paper, but also lamps and umbrellas were made from it, and sliding doors were pasted with it. Paper was used for weaving clothes and ropes, and for making waterproof raincoats. Shaped and lacquered it was used for making boxes. Because of his lightness and strength it was used for fireworks and of course as toilet paper. Washi had and has also much meaning in the spiritual life, f. e. at sacred places of the shinto religion. The history of paper starts in China. The court official Ts'ai Lung is regarded as the inventor of paper, as he presented his paper in the year 105 A. D. to emperor Ho Ti. This paper was actually an improvement of former papers, made from the barks of mulberry trees, hemp, old fisher nets and rags. After this presentation, paper soon got very popular and replaced bamboo strips and partly the expensive silk as mediums for writing. In the year 610 paper came to Japan, where it was presented to empress Suiko by the Korean Buddhist monk and craftsman Danchó. One of Suikos princes, Shotoku, improved this paper and initiated the plantation of kozo trees, which are a kind of mulberry tree. In the Nara period (710-784) with its rich cultural life, paper already had much meaning. One of the first printed texts of the world is dated in this period: the dharani, which were ordered from empress Shotoku. These were Buddhist verses, which were printed until 770, each stored in a small wooden pagoda. The papers used for that were mostly from kozo and hemp. Many papers were dyed or created in special ways, which shows that papermaking of that time had achieved already big progress. During the Nara and the following Heian period, copying of Buddhist sutras was very popular under aristocrats and the need for paper grew rapidly. The general population however had hardly access to paper. In the Heian period (795-1185) the number of paper producing provinces grew from nine to forty. During the regency of emperor Keijo (806-9) the court initiated a perfectly equipped paper mill, the kanya-in on the Kanya river at Kyoto, which produced every year 20 000 sheets of the size 60 x 36 cm exclusively for the courts consumption. The decline of the court power had an effect also onto its paper mill. The papermakers, who had lived a slave-like life until then, mixed with the civil population and passed on their knowledge. More and more private papermaking studios emerged. 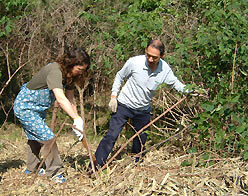 Beside hemp and kozo, also the wild growing bush gampi was used. In the Japanese middle age, the Samurai period (1192-1603), the power moved from the emperors court to the samurai. The conditions got more democratic and so the situation for trading improved. Due to that and the huge need for paper, papermaking made big progress. There was paper for many different purposes like the popular mino-gami from Mino, which was used in the Edo period for all official documents. Papers from Tosa and Suo were used for the daily needs. The thin and soft yoshino-gami was used as toilet paper and for filtration. Paper now was mainly made from farmers during the winter time for an extra income. Normally a papermaking family had a studio with one or two vats, some papermaking villages however had bigger studios with up to 20 and more vats. During the Edo period (1603-1868), when Japan was closing herself from the out world, the daimyos (sovereigns) were maintaining paper mills for their own consumption and for giving the paper as tribute to the shogun. The papermakers guaranteed for the papers quality with their and their families lives. The most popular paper of that time was the hanshi, which was used for books, notebooks, umbrellas and sliding doors and which's size was 25 x 35 cm. From hosokawa documents and maps were made. The santome was used for wrapping clothes. Winter clothes were made from thick paper like the senka from Iyo, while ceremony clothes and mosquito nets were made from shifu . 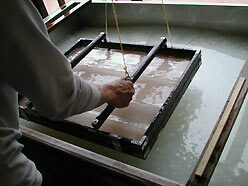 An important aspect was now the use of paper for the woodblock prints with water-based inks. Thousands of editions were printed and sold for little money. After Japans opening in the 1860th, the government of the Meiji emperor initiated a new industrial development to stand even with the Western countries. This resulted in an increasing need for paper, so that the mechanical production of paper was introduced in Japan. While the demand for handmade paper was decreasing, the papermaking craft however stayed alive. In the end of world war two the Japanese papermakers were involved in a military project: about 10 000 paper balloons were built to fly with bombs to the USA. But not many of these balloons arrived and not much damage was done. Today the paper lost its meaning in many of the traditional areas. For the huge demand of writing and printing, paper is produced after the Western method and many things like umbrells and lamps now are produced by using cheaper materials. The craft of papermaking has also changed: different from former times, when paper was made only during the winter which was better for producing high quality paper, papermaking nowadays is done during all year. Some of the natural materials were substituted with chemicals and machines are used now. There are much less papermaking studios today and the knowledge about papermaking is not as common as it once was. The demand for handmade paper however is big: washi is still used as letter paper, for calligraphy, notebooks, business cards etc. It also is the perfect paper for Japanese woodblock printmaking and is widely used for artistic purposes. In old times papermaking was done during the winter season. It was a side business of farmers, who were living in the mountains and didn't have much land for rice farming but a lot of clear water from the rivers. These papermakers were doing all the process from cutting the trees to the actual papermaking. The season began in November after harvesting the rice and ended in April or May with the rice planting. The winter cold also was an advantage for making paper by naturally conserving materials. Today paper is done through all year. The traditional plants which's fibres were used for papermaking are the kozo tree ( mainly used today) and the bushes gampi and mitsumata. 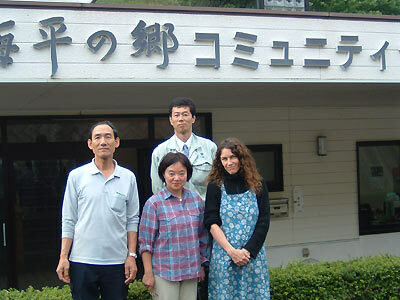 Here I am referring to the use of the wild growing kozo (Broussonentia Kajinoki), which is a member of the mulberry tree family. The branches of the kozo are cut in November after the leafs fell down. They are cut shortly over the trunk and put in bundles of same length. Only the inner white bark is used for papermaking. 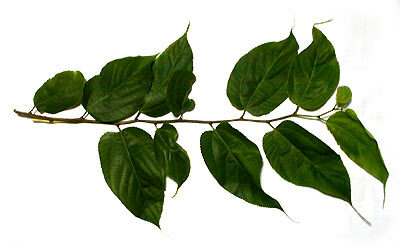 The bark therefore has to be removed from the branch's wooden part. To make this easy, the branch bundles are steamed for one or two hours. This takes part in an airproof barrel or box over a cauldron with hot water. After the steaming, the barks are soft and can be pulled off very easily. The steaming and removing of the bark was a popular work, which was often done in team work of villagers of all ages and both sexes. In this state the bark is called kuro kawa, black bark. It now could be dried and stored for later need. Afterwards the outer black bark and the green bark underneath are removed with a sharp knife, together with spots or damages in the bark. The remaining inner bark is white and called shiro kawa. Only this is used for making fine paper. The cooking and washing of the barks has big influence on the paper, depending on the cooking time and the dosage of the used chemicals. The barks are cooked in an alkaline solution to remove all parts, except the cellulose fibre, like pectin, wax and rubber. Traditionally potash was used while today this is also done with soda ash. After the cooking the water is brown and the barks are washed. Traditionally this is done in a bamboo basket in a river. The fibres can be pulled apart now very easily. Paper made from this bark is not white but has a yellow tone. For a whiter paper the barks have to be bleached, what was done in old days in the river by fixing the barks with stones in the river bed or by exposing the barks to sunlight in the snow. Today mainly chemicals are used for bleaching. The barks now have a silk-like appearance. They are ready for removing specks, dust etc. This work, called chiri-tori, is exhausting and mainly done by middle-aged women. While the barks are floating in the running water of a river or in a bowl, the specks are removed with the fingers. For producing high quality paper the process is done repeatedly. Afterards the pieces are pressed into ball shape. These balls are put onto a board from hard wood or stone and beaten with rods or hammers from hard wood. This way the fibres are pulled apart without getting destroyed. This work was traditionally done by women at night time, so that the material was ready in the morning for the papermaking. During the beating the women sang special beating songs. Today machines are doing that work without singing. For making the paper the fibre pulp is put into a vat with water and mixed perfectly with it, so the fibres are floating evenly in the water. Especially for the later described technique nagashi-zuki, a mucilage substance is added, called neri, which is extracted from the roots of the plant tororo-aoi (Hibiscus Manihot L.). Neri is a very important part of the Japanese papermaking as it makes the fibres float evenly and prevents them from sinking down. Also it makes the pulp run more slowly through the mould during the papermaking and so allows more control over the process. Today neri is also available in synthetic form. 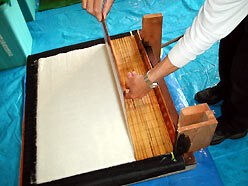 There are two methods of Japanese papermaking. The one is called tame-zuki and resembles the Western method. The mould is shortly dipped into the vat and then moved vertically and horizontally until the water has run down and a layer of clinging paper fibres remains. This paper layer is pressed onto a pile, while the single sheets are separated from each other with cloth. The second method, which is typical for Japan and unique in the world, is called nagashi-zuki. 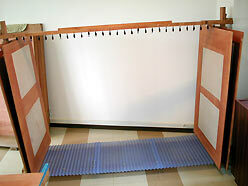 The mould which is used here consists of an outer frame, the keta, which is holding a movable bamboo screen, the su. The papermaking starts with the so called kesho-mizu: dipping the mould just shortly into the pulp and pouring out the excess water immediately. This way the mould gets covered with a thin layer of fibres. This results in a smooth paper surface and prevents the paper sheets from later sticking together. Afterwards the actual papermaking is done by dipping again and sending the pulp over the screen with vertical and horizontal movements. Before the water has completely run down, the rest is poured out, this way removing bigger fibre parts or knots. This process can be repeated until the paper has reached the desired thickness. The frame then is opened and the inner screen removed. It is raised over the papermakers head and let down onto the pile with the already formed sheets. 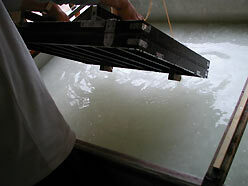 By pouring water over the screens front edge, the paper layer separates from the screen. The freshly formed paper is very wet and cannot be dried in this state. Therefore it has to be pressed which requires a lot of skill and experience. The power in pressing the paper can influence the result. Traditionally the papers were pressed by charging the paper with heavy beams or in screw presses. 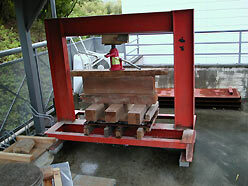 Today hydraulic presses are used. The pressure has to increased very slowly to prevent the paper from being damaged. After the pressing the paper is ready for drying. Traditionally the papers are brushed onto pine wood boards with a horse hair brush. 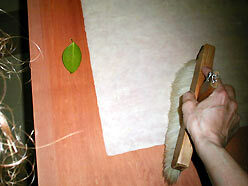 Additionally the edges of the papers are pushed onto the board with a wet camellia leaf. The boards then are exposed to the sun. Today papers are dried on hot plates too. When the papers are dry, they are taken from the boards and roughly divided into classes of different quality. Before being sold they again are checked. Every paper has to have a certain colour and thickness and has to be free von spots. Some papers also are cut to remove the deckle edge. The finished paper of course makes the papermakers heart feel very happy. I want to thank my teacher Okuda Yoshiharu (left), Kosaka Masahiro (middle), the City of Tsuna and all the other people who were involved.